We carry extracts from a wide-ranging interview between Sinn Fein’s Deputy First Minister Martin McGuinness and Shaun Connolly of the Irish Examiner on his campaign to become President, his IRA past, his efforts to end the conflict in the North of Ireland and his call for a vote on Irish unity. Q. You never really wanted to be president, did you? A. I was very philosophical from the very beginning, when I was asked to stand for the presidency -- I did so, throwing myself heart and soul into the campaign and doing my best to ensure we won. So those people who say I never wanted to win, I think they’ve got it completely wrong. I also was very conscious of the fact that it was going to be an uphill task. Q. What was the low point of the campaign for you? A. I think there was obviously a difficult moment in Athlone. Q. When David Kelly [son of Irish soldier Paddy Kelly, who was killed by the IRA] confronted you? A. My heart went out to David Kelly. In situations like that it is very traumatic for people who have been effected as a result of the conflict. But I think that, in terms of live television, that was obviously, for want of a better word, seen as a dramatic moment. I don’t think that was one that was in any way going to advance my campaign and I understood that. Q. Would you see it as a stunt then? A. I can’t say one way or another whether it was a stunt. I know other people have suggested that, but I certainly wouldn’t make that allegation. As far as I’m concerned the person who was in front of me was someone who had lost someone in a violent incident and my heart went out to him. Q. On count night in Dublin Castle you were noticeably tactile with Miriam O’Callaghan. Would that suggest you regret your reaction to her “murder question”? Do you regret storming into her dressing room and confronting her over that? A. I didn’t storm into her dressing room. Q. How did the situation evolve then? A. I very politely, at the end of the press conference at RTE, asked Miriam to have a conversation with me about what she said in the programme. And, you’re talking then about what happened at the count. Effectively, Miriam came off the stage after she had spoken to RTE and went to my wife and two children, two daughters, and apologised for her performance on the show. A. Well, that’s a matter between Miriam and my family. Q. She apologised for asking you that question? A. Well, as far as I was concerned she apologised for her behaviour, and that, as far as I’m concerned, that was the end of it. Q. You don’t feel it was a legitimate question then? A. I think that it wasn’t a legitimate question. In the course of the debate I thought the question was totally out of order. For example, four or five months previously I fought the Assembly elections here in the North, and I was involved in all sorts of TV debates alongside Peter Robinson, and the IRA was not mentioned once. Q. But you’ve never stood in the Republic before, and you do admit to being a member of the IRA until 1974, and the IRA did kill people -- a lot of civilians -- so surely it’s legitimate for that to be brought up? A. During the course of the question she described me as a murderer -- on what basis was she making that allegation? Q. Because you are a member of the IRA? And there are many people who have been members of the IRA who haven’t killed anybody, so I think it wasn’t a legitimate question. Q. Is there not collective responsibility for the deaths? A. Nobody is charged here in the North, or as far as I understand, in the South with killing people by dint of the fact that they were members of the IRA, that’s what the law says. Q. During the conflict, the British murdered people -- most openly on Bloody Sunday -- and also by proxies, and the loyalist groups murdered people. So are you saying the IRA never murdered anybody in 38 years? A. No, what I’m responsible for is what I did when I was involved with the IRA. I was involved with the IRA because the people of my city were being treated like second- or third-class citizens and were being beaten and tortured and shot by the British army. I refuse to apologise to anybody for fighting back. I also do not stand over the IRA killing of any innocent person, and I have been on the record of being critical of the IRA when they did so in the past. Q. You would accept that at least some of the IRA killings during the conflict were murders? A. The IRA have been on the public record as having apologised for people who were killed, people who were non-combatants who were killed by them and I think it was the right thing to do. War is a terrible thing, and in a war situation many things are done which people think are not fair. Q. It seems incongruous that the IRA is unable to admit that it -- to use the same terminology -- did murder some people. A. You can talk to the IRA about that. Q. Well, you were a member of the IRA -- I don’t know any other members of the IRA. A. I left the IRA in 1974 and, in my opinion, the IRA during the course of the conflict in Derry, their battle was against the British army and the RUC. If you’re asking me when the IRA killed British soldiers on the streets of Derry was that murder, I don’t belive it was -- I believe it was self-defence. Q. But was it murder when they killed Jean McConville [executed by the IRA as an informer in 1972]? A. I don’t know anything about the circumstances surrounding Jean McConville -- other than it was alleged that she was an informer for the British government. Q. So your view would be the IRA didn’t murder anyone in 38 years? A. No, no, it’s not my view at all. My view is very, very clear that I am answerable for what I did and the IRA are answerable for what they did. There are people out there who belive that their loved ones were murdered by the IRA. Am I going to contest that view with them? No I’m not. Q. The fact that people didn’t believe you’d left the IRA in 1974 seemed to irritate you a lot in the campaign. A. How did it irritate me? Q. You clearly were irritated. I stated my opinion whenever I was asked. I never had to fight when I was in the IRA, and I am not ashamed of being in the IRA during the course of what were very difficult times in Derry city, when people were being murdered by the British army. Q. But why did you decide to leave in 1974 then. Surely it’s not like letting your gym membership elapse? A. Because I wanted to build Sinn Fein as a political party and I wanted to be part of opening Sinn Fein advice centres and I wanted to be part of ensuring that ether was a Republican voice able to speak on behalf of Irish Republicanism, and I have been at the heart of trying to build Sinn Fein in the North for decades. Q. What are the practicalities of leaving the IRA? Who do you go to hand in your resignation to? A. Well, you don’t have to hand in your resignation. What happened in my case is that I got out of prison in November 1974 and the practicalities of it is either you report back to the IRA or you don’t. Q. They don’t come looking for you? A. No, they don’t. It’s up to you to report back. Q. How many times did MI5 try to turn you? Q. Really? But surely you were a senior figure. They would have tried it on with everyone? A. No, never... I’ve never been approached by anybody either in the RUC or MI5 to give information. Why? Because they knew it would be a waste of time. Q. The IRA did seem to be quite heavily penetrated again by the late ‘80s though. Would that be your view? Q. Do you think that [former Taoiseach] Bertie Ahern’s role in the peace process has been overstated? A. The key player, if your asking me to make a judgement on the two governments, was Tony Blair. Tony Blair’s arrival in Downing Street in 1997 was of immense significance. Q. No British prime minister cast a shadow over Northern Ireland like Margaret Thatcher. The IRA came within seconds of assassinating her in 1984. If that had succeeded, what gains would that have given to the Republican movement? A. It’s hard to know. It didn’t happen. Q. Not for the want of trying. A. Absolutely. But she continued in power, and it was quite interesting that just before she left office it was quite clear that she authorised someone to come and speak to me. 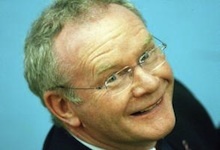 I met with him, both with the support of Sinn Fein and the IRA. Q. Do you have any interest in seeing the Thatcher movie? A. Not really, but I’m a huge fan of Meryl Streep and would be delighted if she got another Oscar because she is such a fabulous actress. Q. You seem to be changing your position on whether you want to meet Queen Elizabeth or not -- but why on earth do you think she would want to meet you? A. (Laughs) Maybe she wouldn’t, maybe she would have no interest at all. But I am told on good authority, by people in the know, that Prince Charles has been discussing this with people in the political process. But I have to say I have had at least six written invitations from Buckingham Palace to garden parties in the palace over recent years. I haven’t attended any, but I suppose that answers your question. Q. The Presidential campaign was at times surreal. You had, at one end of the spectrum, Dana claiming to be the victim of a murder plot, then we had you being accused of murder on live TV. It was a bit of a circus. A. There were too many candidates. There will be a huge study done on how the media handled the election. We had [TV3 debate moderator] Vincent [Browne]’s theatrics, pulling out the books of some people who would be, in my opinion and the opinion of many others, very unreliable witnesses. Q. No apology from him then? A. (Laughs) No, no apology. Miriam didn’t apologise to me -- she apologised to my wife and two daughters. Q. Your ‘West Brit’ comment [about sections of the media] irked people -- it was quite dismissive. A. It wasn’t designed to irk anybody. If you look at the reaction of people in the North at how the media conducted itself, particularly in regard to myself, there is considerable annoyance. Q. But it’s a loaded term. It’s like a black person calling another black person a coconut, because they’re white inside. You seemed to be insinuating that some Irish people aren’t as Irish as you are. A. No, I do believe the overwhelming majority of the Irish people are as Irish as I am, and I am certainly as Irish as they are, but I do believe that there are people, particularly within some sections of the media in Dublin, who are very sympathetic, if you like, to the British. Q. Are you disappointed your relationship with Mr Robinson doesn’t appear to be as warm as your one with Ian Paisley? A. People heralded Peter Robinson coming to the First Minister’s position would mean we moved from the Chuckle Brothers to the Brothers Grim -- nothing of the sort. Q. His body language to you is often quite difficult. To me it looks like he wants to punch you half the time. A. I don’t know how you can make that assessment. I had a good personal relationship with Ian Paisley, but I have a better working relationship with Peter Robinson. Q. Would the DUP ever be ready for a vote on the future of the north? A. At some stage in the future, yes. Q. It looks like Scotland will have a vote on leaving the UK a long time ahead of the North. When would the North have one? A. In all probability, the people who have got the power to put that in place won’t even contemplate it this side of the next Assembly elections, which conceivably could be 2015 or 2016. Q. So the vote would be in the next term then? A. I don’t see any reason whatsoever why that should not be considered. A. It just seems to me to be a sensible timing. Q. A vote on the future of the Six Counties? A. It would be on the question of whether or not the people of the Six Counties wish to retain the link with what is described as the United Kingdom, or be part of a united Ireland. Q. Why would the North vote to join an economic basket case like the Republic? A. It’s a mistake to think people are going to decide their future on what has been a particularly disastrous period of the handling of the economy by the government in Dublin. People will make a decision on the potential that the reunification of Ireland can bring for them in terms of political stability and in terms of having economic levers in their own hands.